Making skillful use of all the power its V6 engine generates and efficiently applying it to the road, as the driver requires, is accomplished by the Azera’s 6-speed automatic transmission with SHIFTRONIC®. Getting the optimal mix of fuel and air into the combustion chamber is key to the science of engine tuning. It’s a simple goal that can get very complicated. But Hyundai takes advantage of Gasoline Direct Injection (GDI) to inject the fuel directly into the combustion chamber. The result: high levels of both power and fuel economy. A good measure of Azera’s innovative thinking starts under the hood. The 3.3L V6 engine creates an effortless flow of power and surprising fuel efficiency using advancements that include Gasoline Direct Injection (GDI) and Dual Continuously Variable Valve Timing (D-CVVT). 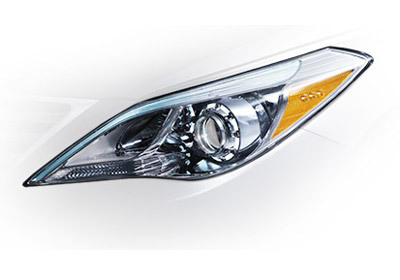 With their jewel-like facets, Azera’s LED front accent lights and available HID Xenon headlights flank an elegantly curved grille, helping the driver see and be seen. 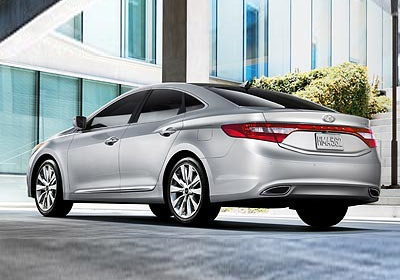 In addition, high-efficiency LED tail lights minimize energy consumption and maximize Azera's sense of style. 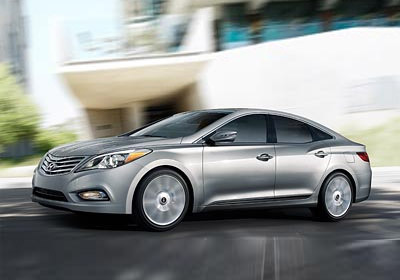 Hyundai’s Fluidic Sculpture design philosophy has quickly won many admirers, accolades and owners around the world. The Azera is a sophisticated interpretation of this dramatic design language that creates a sense of speed and movement. This chrome-tipped dual exhaust system is beautifully integrated into the rear bumper. It’s also tuned to complement a powertrain designed for power and efficiency. The available panoramic tilt-and-slide sunroof opens up Azera’s spacious interior to a world of natural light and expansive views. Its design makes the most of a satisfying driving experience and puts you closer to the environment. The driver and passengers can enjoy an array of available seating options that include: front and rear heated seats and ventilated front seats. The available 12-way adjustable power driver seat also features an optional seat cushion extension and an Integrated Memory System (IMS) with two memory settings for the seat, side mirrors and steering column. When the sun drops below the horizon, the mood in Azera’s cabin changes. Its available interior lighting system adds soft, ambient light that’s beautiful and illuminating..
Azera’s standard 6-inch color LCD audio system includes an iPod®/USB port and auxiliary input jacks, plus a Bluetooth hands-free phone system that keeps you safely connected. Select the available 550-watt Infinity® Logic 7® Surround Sound Audio System for even more power, speakers and features. 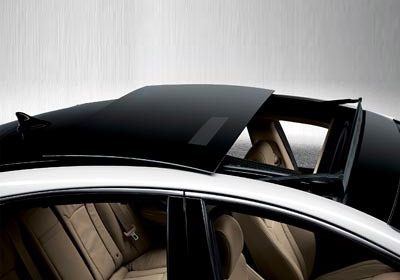 Its extensive passive safety technology adds to the secure feeling that comes with driving the Azera. For protection in a collision, Azera’s nine-airbag safety system includes two front airbags, four front and rear side-impact airbags, two side-curtain airbags, and even a driver’s knee airbag. The front seats in the Azera provide the comfort and support one expects, but buried deep within their design is the increased ability to absorb shocks in the event of a rear-end collision. This type of structural reinforcement has been shown to reduce neck and head injuries by 17%. According to national insurance claims, over 25% of accidents happen while in reverse. When you put the Azera into reverse, the rearview image with parking guides is displayed on the Azera’s 6-inch LCD screen or available 8-inch touchscreen to increase your vision and awareness. For challenging maneuvers in tight parking lots or while parallel parking, an available rear parking assistance system provides an audible warning signal when nearby obstacles are detected.